marta writes: the contents of a collage. the contents of a collage. on january first i had it all in me to reorganize my life from top to bottom. i need a clean slate and i've been thinking a lot about how to balance real life, online life and my freelance life. therefore i am in the midst of building a plan / routine that i can stick to. with plenty of flexibility for creativity. it's hard to break my last minute ways. when piles stack up and papers are whirling, i often tell myself that messiness equals creativeness–and sometimes it does–but my bulletin board was getting out of control. and in my mind, it all starts there. i even mentioned it last year and never got around to re-doing it. yikes. i still had my 2009 resolutions pinned to it, three layers below. (here is a peek at its crazy before state.) therefore 2011 hit and i knew it was time for a mini makeover. when dan pulled it off the wall for me on new year's day, he said, now i know you mean business. he then took benji cow spotting while i reinvented myself for a few hours in peace. loose papers, pushpins and toddlers don't mix. i took everything off my giant bulletin board and separated the contents; threw useless post-its away and gathered notes that need to be saved in a binder somewhere. i also always save favorite rip-outs for another collage in the future. i keep cool business cards and note cards from loved ones and hang them up for awhile and then tuck them away for safekeeping. i decided what should stay and what should be filed. i still have a favorite quote, written on a folded piece of paper, that used to be tucked into the dashboard of the yellow truck i drove to high school. i am a sentimental fool; i can't bear to throw it out or even re-write it. it remains pinned up. (i'll have to share it with you soon.) then i think about what i need right near me as i work, what i'd like, and what would be helpful for my control panel. knowing myself, i know full well that i'll find more things to tack up, so i even left a little breathing space. 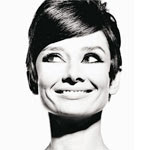 #1. i took a look through my hope chest and found dozens of letters from my past that made me happy. i took out my favorites and pinned them up; a postcard from my dad, cards from my mom, a birthday card from dan, a photo collage from my brother pete when he lived in germany and a short journal entry taken from my mom's journal when she was pregnant with me. the magazine letters D and M stayed up due to dan's cute sentiment, those are staples. i also have a reference guide to envelopes and what sizes they are in inches, you have no idea how helpful this is when it comes to designing invitations. i really should laminate it. #2. i unearthed this awesome poster that doubled as a greeting card from my darling bff whitney. she tends to find the best note cards out there, some of her favorites are found here. after rifling through my pouch of pretty cards with familiar handwriting on them, i resolved to keep sending mail. emails don't come close to going through old letters. #4. the best idea yet for my bulletin board 2011 is utilizing mini clipboards. these are from Staples. i had these on hand and put up five, each for its own category (which is subject to change). i already love them! i can simply grab one, jot a note or write an item on my to-do list and hang it back up in its spot. i can also clip up loose post-its, receipts, and lists that i need near my computer and toss them when i'm done. i think this idea will save my life. #5. i save important business cards from local print shops i use or others for addresses that i need to constantly refer to. (it's way easier than opening up an address book.) i ship packages to my dad's office a lot, so his is pinned up there and dan's is up there too, for good measure. #6. this is where i pin pages from magazines. 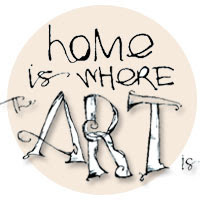 these days they are constantly referring to fabulous websites and up and coming blogs. that way it's easy for me to hurry and bookmark the sites that i'm interested in without forgetting all about that one article in that one magazine..
#7. this clipboard is devoted to favorite incoming postcards, recent artwork or photographs that i don't want to put a pin in, but have yet to find a frame for. benji's little painted handprint reminds me of all that is good with the world. i'm seriously ecstatic about mini clipboards. i did the same thing with mine! helps so much.. i looked in your shop for the mini clipboards, can i get those at michael's or somewhere similar? and i'd love to know what the letterpress subway print says - i'm a sucker for anything NYC. loved this glimpse into your work space and i love the mini clipboards too. i have a space behind my desk that I have been hemming and hawing (sp?) over forever as to how i want to organize it...bulletin board, wire cord, etc. i have found this so inspirational...thank you! The Girl with the Pearl earring. One of my favorite paintings. Why have I never put a small copy on my bulletin board?? such a good idea. And your organizational skills are to be envied! I've got to get me some mini clipboards! How inspirational you are. What a great way to start the new year! I have a little project in mind involving the frame of my pinboard but am determined to give it a rejig once I have sorted the frame. Yours looks fab! Can I ask how you hang the mini clipboards? Do ordinary pushpins hold them? I absolutely, postitively love this post. Mmm...don't you love the messy perfection of collage? Well, duh, of course you do. And wouldn't you know, I recently acquired a stack of mini clipboards and was planning on surrounding my desk/workspace with them! i did the same thing with my kitchen pantry this week...there's something incredibly motivating about starting the year with a freshly organized space! hi marta! i love, love bulletin boards and the organized clutter they let me keep. if you wouldn't mind, could i get a copy of your envelope reference guide? it sounds like it would be most helpful. would also love to see you letterpress. I LOVE your beautifully organized work space... some day I'll have a space of my own. Marta, I love this post!!! Right now I have a small cabinet in my daughters closet that serves this purpose but I may have to extend to an available wall. So inspiring! Bulletin boards a just the best - I have a magnet bulletin board next to my desk with all kind of inspiring and informational stuff on it. But it is way too small. But I plan to paint the wall with magnetic paint so the whole wall will be my magnetic bulletin board. THANKS for all the nice words. yes, i did get the clipboards at Staples. (they can easily be mod podged to look a bit more fabulous too.) just a standard pushpin holds them up perfectly, just remove the clipboard, no need to unpin them! You are the collage queen. I wish we had pictures of your bedroom back in the day—totally wall papered with the guys in the the Abercrombie and Fitch catalogs! You've been at this your whole life—no wonder you're so good. Marvelous, Marta! I have a collage in my word space as well. Mine looks like a complete mess, though. I needed this little bit of collage inspiration. You mini clip boards? Ingenious. 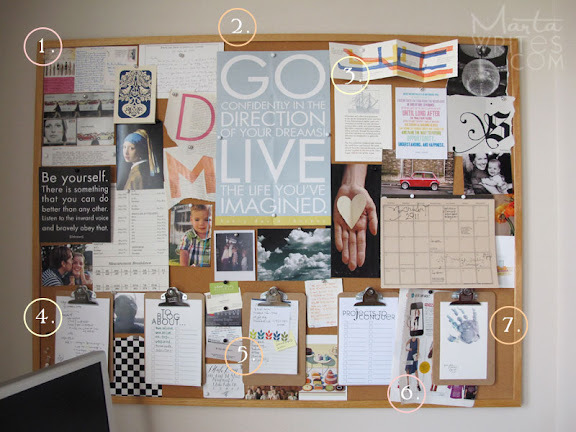 My inspiration boards are magnetic. I must figure out a way to magnetize some mini clip boards. I love making lists so those clip boards are brilliant! And that letterpress class sounds amazing! If my university had that class I may have stayed an art major. I love your board! It is so inspirational! Where did you get those mini clip boards from? I just love them! Thanks for the inspiration! I really want to do mine this year. Having an inspiring place to work welcomes creativity, don't you think? I need to work on getting my space in ship shape. We've recently done some room swapping so everything's in a jumbled mess. I love the collage - the mini clipboards are genius, and the mix of sentimental + business is great. Especially the mini-clipboards. Staples here I come! i so enjoyed this post and i need to get my board back in shape to enjoy as well. i was thining about the misc. 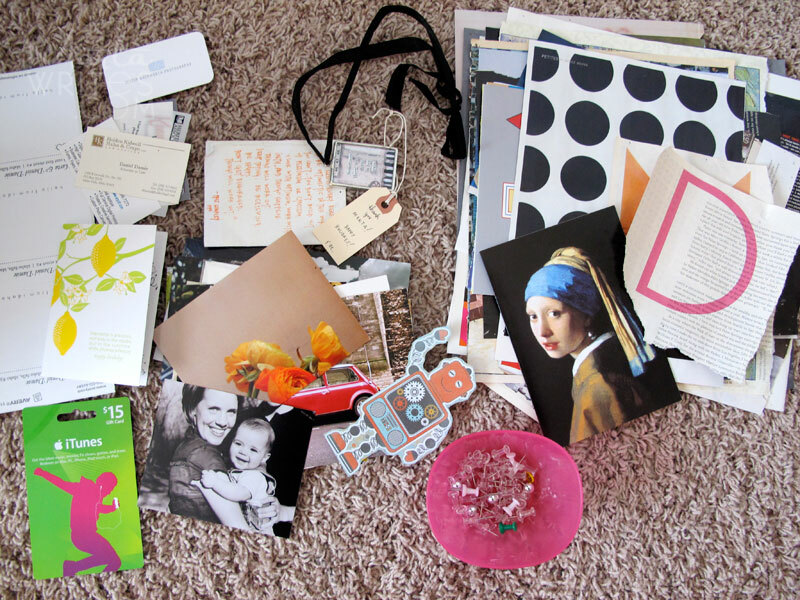 bits and pieces of things that i too have kept tucked away here and there. these things are so precious. i love, love that you have a page from a journal your mum kept whilst she was pregnant with you. oh so sweet! 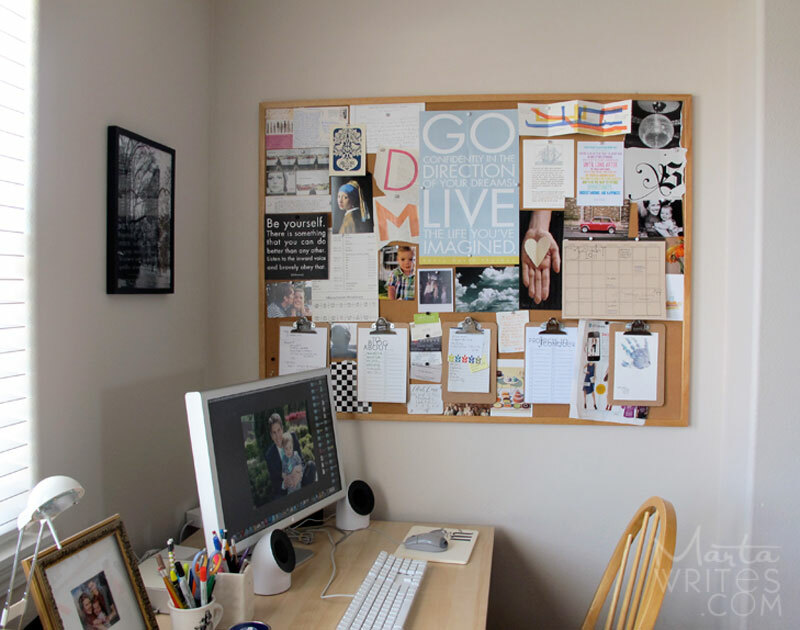 i owe my current state (a re-discovered state) of bulletin board love completely and solely to you, mart. i wouldn't know how great they can be otherwise. your finished collage is fabulous!! such a great blend. the puffy clouds at the center might be my fave. one of these days, i'm going to get myself a nice, big square of cork. for reals.